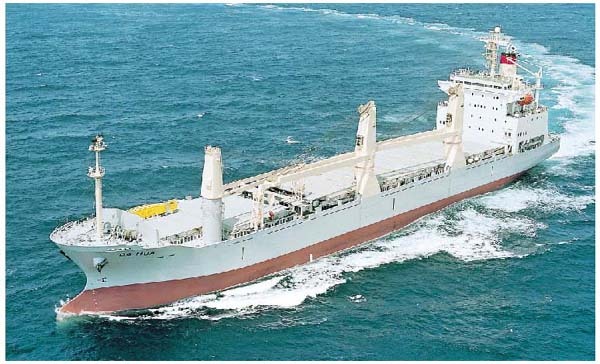 The 16,957-dwt heavy cargo ship DA HUA was built at Sakaide Works of Kawasaki Heavy Industries, Ltd. and delivered to DA HUA Maritime (COSCO) in July 1998. The ship has three deck cranes： two with a hoisting capacity of 250T and one with 30T capacity. The maximum hoisting capacity is 500T. The flat deck type with the forecastle allows various types of cargoes. The No.1 cargo hold (fore) is 37.4m long and the No.2 hold, 72 m long for lengthy and heavy cargoes. The No.2 cargo hold has a second deck of which the height can be altered into three stages according to the cargo height. Two removable intermediate bulkheads are provided below the second deck. A ballast control console is installed in the wheelhouse, and is provided with automatic heeling control system. The system permits the control of heavy cargo handling during loading and unloading operations. The ship can carry 685-TEU containers, 380 in the cargo holds and 305 on deck.